Demetrius Johnson of Northmor defends a Cardington pass intended for Garrett Wagner Friday night. 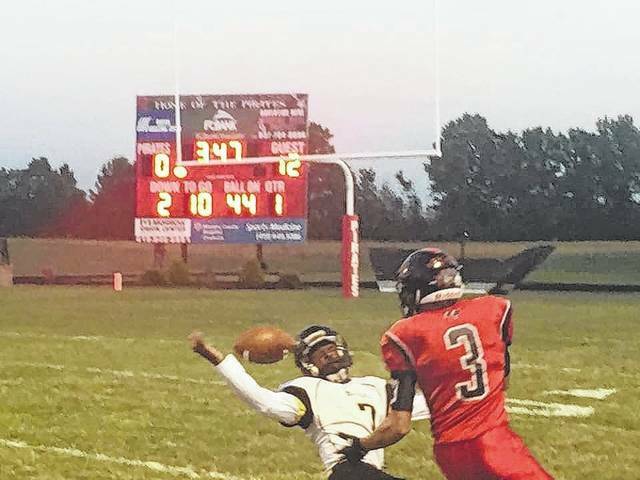 CARDINGTON — Northmor took a little while to rev up its offensive engine Friday night. But when the Golden Knights hit high gear in the second half, they cruised to a 32-7 victory here to spoil the Pirates’ homecoming. Northmor (5-1, 2-1) lead 12-7 early in the third quarter. But a Cardington fumble opened the door to the first of three Northmor touchdowns courtesy of quarterback Demetrius Johnson covering 23, 30 and 40 yards. Johnson added a 3-yard scoring burst in the opening minutes and racked up 240 rushing yards on 25 carries. Northmor coach Scott Armrose credited the Pirates with a solid game plan. Armrose said his team has been a solid second-half squad all season. Sophomore Conor Becker didn’t play due to an injury. Cardington got a solid performance from running Mason Goers, who carried 15 times for 122 yards and a 3-yard touchdown. Northmor ran for 309 yards to Cardington’s 124. The Knights were forced to punt six times, with Johnson averaging 39.6 per boot. But three turnovers and some untimely penalties hurt the hosts. Northmor had 10 flags for 75 yards and Cardington 5 miscues for 35. Conan Becker added 53 yards on seven carries, including a 41-yard TD run. With the win Northmor sets the stage for a showdown with Knox Morrow Athletic Conference opponent East Knox, also 5-1, for its homecoming game. “It’s a huge week coming up for us, no doubt. But the boys have done a great job of staying focused and avoiding distractions,” Armrose said. Cardington must regroup as it faces two tough road games. “We just have to get better. Our kids are trying hard and practicing hard. We just have to get a little bit better each week,” Wolford said. The Pirates (2-4, 1-2) play Danville Friday night in another KMAC contest. “We have two tough games on the road — Danville with Highland to follow,” Wolford said. Daniel Kill and Katelyn Denney were crowned king and queen during pre-game ceremonies. Kill is the Pirates senior quarterback and he completed two passes for 41 yards. https://www.morrowcountysentinel.com/wp-content/uploads/sites/29/2017/09/web1_NorthmoratCardfootball.jpgDemetrius Johnson of Northmor defends a Cardington pass intended for Garrett Wagner Friday night.